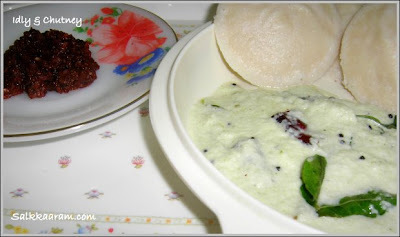 Idli , Chutney and Ulli Chammanthi | Simple and Delicious ! Soak raw rice and matta rice with balack gram dal in water for 3 or 4 hours. Wash and make a batter of all the ingredients using enough water to make it thick. (add yeast if needed). Keep in a container for about 12 hours to ferment. Make idlis using the idli vessel. Grind everything together. Season with the above. Peel small onions, wash them. Sauté small onions for few moments till it turn color and then sauté red chillies. Take them out from oil, grind with tamarind and salt. You can make them without sautéing also. For that just grind all the ingredients as raw and add coconut oil in the end. there was a time i hated idlies.. but now being away from home, i love these guys.. i do not know how this change came about! 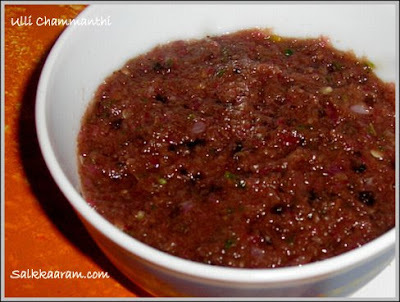 This chutney sounds good how do you make your tamarind paste seens please? All three looks great.Chammanthi is new for us, will try next week. idli and sambhar is one of my favourite breakfast. wonderful pics and color of ulli chammanthu looks nice. No other breakfast will beat idli-sambar combo!! that's a good recipe! thanks, happy to hear ullichammanthi resembles the way your mother makes..
Me also like that, when we are away from our mom we wish to get what she cooks, isn't it..thanks for visitng here.. So you are lucky, you can make idlis seven days..mmmm? here no way..
Definitely it is very comforting..thanks for visiting here..
will post the recipe of tamarind paste soon, about meme, will post it too, now here school opens after vacation , so little busy.. Happy cook, once you try making idlis with chutney,sambar and ullichammanthi, sure you will be happy..
thanks, next make ullichammanthi also..will add taste to your bf.. I love to see your version also.. Correct Usha, I love them as Bf,lunch and dinner.. So yoummy the idli and chutnies look...will try out the chutnies soon when i make idli. Meera, glad to see you back..
matta rice is the parboiled rice..that red one, we say palakkadan matta..not basmati.. I adore ulli chamanthi, this seems a new version & I love the colour. 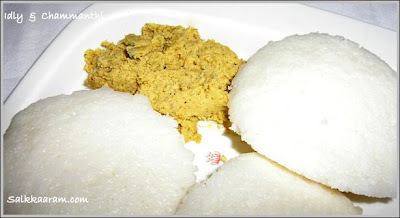 Was planning to make idli, sambar & chutney tomorrow for b/fast, will add this to the Menu too.